Quantitative Section of SSC or any other examination is usually hard nut to crack for most of the aspirants. In order to triumph these types of examinations, one has to be diligent in his preparation. I have blogged about the syllabus, pattern, and books which one should follow before commencing his preparation. After these steps, it becomes requisite to know from where to commence and how to proceed as smart and hard work both required for any type of examination. If you are willing to take coaching, you are going to gain in terms of concepts and how should one proceed. But, after that practice and regular mock test are necessity in this regard to combat the examination. We are going to discuss each and every step to begin from bottom to top so that without coaching you can manage your time and clear your weaknesses and concepts. 1. Buy books (click here) as listed on previous blog. Now, we tell you how to begin with these books and how to clear your concepts. First, books should be Arithmetic for General Competitions English by Neetu Singh and Quickest Quantitative Aptitude Useful for all Competitive Exams . These books have explained the topics of arithmetic’s chapter with detailed tricks and concepts. Practice their exercise and solved questions and practice them too. If you find something tricky and not able to grasp it properly, you may write down the question and its solution or just try to solve it with your concept you know. This technique of clearing concepts will help you comprehend tough questions and also with written practice you can evaluate and analyse the tough questions which you are not getting. 2. You have to spend at least 2-3 hours initially for Quantitative section, if you are starting from the bottom clearing concepts of different topics. You can start preparation any time before the exam date announced. But, it would be wise to commence at least 3-4 months before the exam date. This will give ample time to clear each and every question from its depth and practice different types of same questions. 3. Now, the target should be Advanced maths (geometry, trigonometry, mensuration, algebra) as questions from these topics have great weightage of in both Pre and Mains examination. Pre examination 10-15 marks of questions are from advanced maths topics and in Mains, there are at least 45-50 marks weightage. So, do not try to avoid it, instead practice as much question you can from this topic. 4. 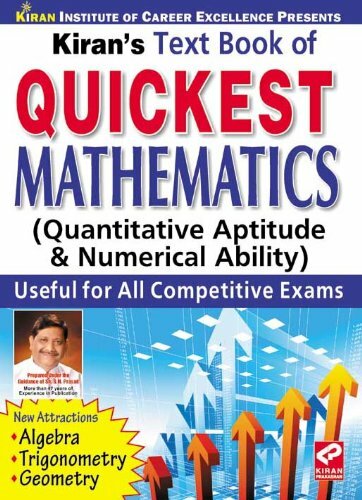 For advanced maths, buy books- Advance maths for General Competitions (English) by Rakesh Yadav and SSC Elementary & Advanced Mathematics (English) by Kiran Publication . These two books cover all topics and the question after each chapter are very good and stick to you the exam pattern. Hence, you no need to extra questions or someone helps to comprehend the questions of this topic. You have to carefully practice each and every question mentioned in these books. 5. If you feel the concept is tough and there should be another way to do, just try to search over the internet or write down the concept to clear it in your mind. This will really help you understand each and every step the question is proceeding. Also, must mark the tough questions so that you can remember which questions or topics disturbed you the most and when you again go through the books, you can easily point out those questions. 6. Next step is the most important and requisite- Practice. This should not and cannot be cut out appearing for the exams. There is various publication whose books are available but few books which I suggest- SSC MATHEMATICS CHAPTER WISE SOLVED PAPERS 1999- till date 5500+ Objective(English) ; Paramount Test Series SSC CGL Tier - 1 ; Kiran's SSC CGL combined Graduate Level Exams Question Bank 1999-2014 (48 solved papers of previous year exams) ; These books are really helpful and polish your concepts and boost up your confidence. 5800+ question bank is really good and compiled the various questions topic wise, whereas you can set timer and take mock test from books of paramount publication and previous papers of SSC CGL tier-1 by Kiran publication. Mock test is part and parcel of every preparation. This will show you how much you are capable of doing question in limited time, your speed, your accuracy, your weaknesses, your strong zones. 7. You can also buy mock test of SSC Tier II Model Papers Maths(English) by paramount and SSC CGL Staff Selection Commission Combined TIER-II Exam Practice Work Book Including Solved Papers of 2010, 2011, 2012 & 2013 (English) . They will also prove beneficial for Pre and Mains examination both. If you have ample time to study and have practiced the questions from above mentioned books 2-3 times. You can buy How to Prepare for QuantITative Aptitude for Competitive exams by Arun Sharma . This book is also good and covers high level of questions. You need to just cover level 1 and 2 questions of its exercise. 8. This much practice and way to reach the end will definitely fetch more marks and as much as required. You have to do one more while studying, just figure out on which topics you are weak, which portion requires greater attention, why are scoring less in mock tests, what can be the shortest way to solve the questions. Answer and analyses of these questions, every time you practice will definitely check your weaknesses or where you have to put more hard work so that anything do not go untouched. Comments "Beginner's guide to start with Quantitative section for SSC exams"